Sophomores Evan, Jonah, and Mateo, core members of The New Mexico Jazz Workshop Quartet which emerged victorious in last weekend’s first annual NM Jazz Competition, will head to to the Saulkrasti Jazz Festival in Latvia this July to perform their music in front of thousands of people at one of the most prestigious jazz festivals in Europe. 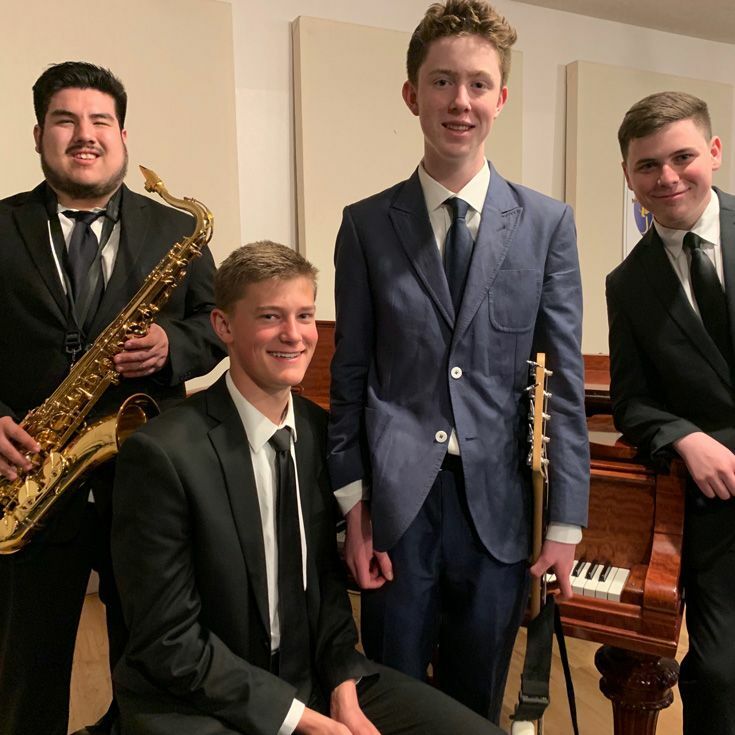 The three, who have been playing together for many years, joined with saxophonist Paul Lovato for the competition; together, they beat out a quartet from New Mexico State University for the opportunity to play internationally. "The New Mexico Jazz Workshop (NMJW) is thrilled to be able to provide this opportunity with our partner festival in Europe (Saulkrasti Jazz Festival-Latvia),” said Markus Gottschlich, Executive Director of the NMJW, which sponsored the competition. “It's a major stepping stone for these students' musical development and career. Being able to travel abroad to perform original music in front of an attentive and enthusiastic audience is probably the most rewarding aspect of being a musician. Also, it really puts New Mexico on the map and the talent that comes out of this state." Pianist Evan, drummer Jonah, and bassist Mateo have all been recognized as top musicians and improvisers at the middle school and high school level in the state of New Mexico, both in All-State, and the Albuquerque-UNM Jazz Festival. Paul Lovato, was awarded for "Musical Excellence" by the U.S. Marine Corps, and won Gold and Silver medals from the Western U.S. Bagpipe Band Association. Evan was chosen (along with 40 other students from around the world) to attend the Berklee Global Jazz Institute Summer Workshop, where he studied with masters like Danilo Perez and Tia Fuller. He was also a featured performer on the main stage at Newport Jazz Festival and won the inaugural John Lewis Award in Albuquerque. Jonah said he’s been playing drums for seven years, but credited Bosque performing arts teacher Stuart Fessinger for introducing him to jazz in the 6th grade. He also expressed his appreciation to Tom Guralnick for help with recording their audition video and introducing them to new member, Paul. Congratulations to Evan, Jonah, and Mateo!